Whether you’re a contractor making purchases for your business customers or a homeowner looking for a new HVAC system, you can trust the experts at W.E. Kingswell to work with you to find solutions that work for you. Whether you’re a contractor making purchases for your business customers or a homeowner looking for a new HVAC system, you can trust the experts at W.E. Kingswell to work with you to find solutions that work for you. There are a few options for residential air conditioners, mainly heat pumps, ductless systems, and traditional air conditioners. Each has its own merits and drawbacks, and those things will be different for every home. Choosing the best system depends on the needs of the needs of the home’s occupants. If you need air conditioners that perform both heating and cooling, you actually have a few options. 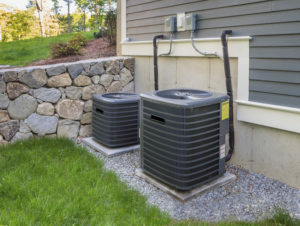 Heat pumps work by removing heat from inside your home so that only the cooler air is left. In cooler seasons, they work in reverse by removing heat from outside air and bringing it into the home. There are also ductless systems that also provide heating. Ductless systems tend to work best in open areas, as there is nothing to carry the air through into other rooms. Ductless air conditioners are great for zoned heating and cooling. When a ductless system is installed, it is just for that space where it’s installed. Since there’s no way for the air to pass through walls, the ductless system will only heat and cool the immediate area. It is also possible to have zoned heating and cooling with air conditioners and heat pumps. With these systems, each zone has its own thermostat and there are dampers installed within the ductwork to direct the warm or cool air to only those places where it is needed. For customers who are concerned about keeping energy costs down, you can recommend heat pump units. It requires very little energy to produce cool air, and they can efficiently heat homes and buildings in the cooler months. If there is a particular brand or type of unit that you’re looking at, see the Seasonal Energy Efficiency Ratio (SEER) rating. The Federal minimum SEER rating is around 13 or 14 depending on where units will be installed, but there are high-efficiency systems available that have ratings all the way up to 26. This entry was posted on Thursday, June 14th, 2018 at 6:43 am. Both comments and pings are currently closed.